James Wilson has been tracking the demonetisation drive since it was announced by Prime Minister Narendra Modi on November 8. During his investigation, he discovered that contrary to claims, no new security features have been added to the new currency notes apart from what existed in the ones that were demonetised, and hence counterfeiting is not going to be halted. He posted his findings on his blog titled 'Decipher the Demonetisation'. With Wilson's kind permission, Rediff.com is sharing his views with our readers. Demonetisation was welcomed by many Indians since they viewed it as a panacea for all the ills like black money, terrorism abetted by fake currency, etc. There were a lot of Indians who believed that there is lakhs of crores of black money and fake currency in the system. In the initial weeks of demonetisation, a narrative was spread by the evangelists of demonetisation, that black money and fake currency (Fake Indian currency notes, or FICN) was rife, and many argued that it was almost 30-40% of the total currency in circulation. RBI data shows that as on November 4, 2016, the currency in circulation was Rs 17.975 Lakh crores. We were later informed in Parliament that out of this, 86%, ie, Rs 15.44 Lakh crores, were of high denomination notes of Rs 500 and Rs 1000. Now let’s examine the quantity of FICN in circulation from government's own database. Yes. The government's own agencies estimated the quantity of FICN at just Rs 400 crores, not running into thousands of crores, forget the lakhs of crores as propagated. This Rs 400 crores is only 0.02% of the currency in circulation. Though it is a small quantity, FICN is used for various subversive activities such as espionage, smuggling of arms, drugs and other contraband. As per the NIA probe, which has a Terror Funding and Fake Currency Cell, Pakistan is the major supplier of FICN in India. Further, the finance minister disclosed in Parliament on November 18 that the details of FICN detected by police and law enforcement agencies during 2013-16 (up to September 30), as per he records of the National Crime Records Bureau. Meanwhile, the annual report 2015-16 of the RBI reported that 632,926 notes of various denominations were detected by the banking system from a total 90,266 billion notes in circulation, ie, 0.0007% of the volume. Value-wise this amount of FICN is Rs 29.642 crores out of the total Rs 16.42 lakh crores currency in circulation, ie, 0.0018% of the value. If we consider this Rs 29.642 crores of FICN denomination-wise, that comprises Rs 14.310 crores of Rs 1000 notes (143099 no.s), Rs 13.085 crores of Rs 500 notes (261695 no.s) and Rs 2.215 crores of Rs 100 notes (221447 no.s), which are 0.0023%, 0.0017% and 0.0014% respectively of the total value of the above denominations in circulation. 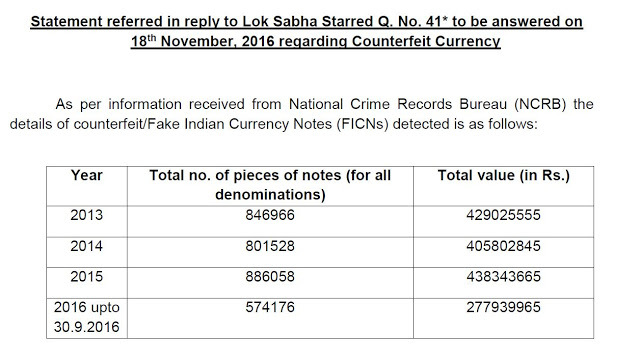 The RBI made it clear that the above data does not include counterfeit notes seized by the police and other enforcement agencies. We can see that the banking system detected around Rs 30 crores of FICN annually and law enforcement agencies seized around Rs 40 crores of FICN annually for the last couple of years. Hence a total of around Rs 70 crores of FICN detected during the last couple of years by the checks and balances in the system. So if we take the ISI, Kolkota, study as a yardstick, only Rs 70 crores of FICN of the estimated quantity of Rs 400 crores, ie, 17.5% of the FICN, is seized by our systems. Kindly note that the ISI study, is a statistical one using certain parameters, the real FICN may be more or less than the above figure. Meanwhile, ISI, Kolkota who did the study on FICN, however, concluded that "the existing systems of seizure and detection are enough to flush out the quantum of FICN being infused". The institute says that if detection can be improved, the value of FICN in circulation can be reduced by at least 20% annually. I don't know whether our government and RBI have considered the above report and these facts before taking the decision on demonetisation. I don't get the logic of demonetising 86% of currency amounting to Rs 15.44 lakh crores to trap Rs 400 crores. It looks like firing a cannon at sparrows. The RBI instructed banks to report daily the details of FICN detected in the system during the 50-days period post-demonetisation. But so far it has not disclosed the quantity of FICN detected in the system to the public. We should recall that around 0.0018% of FICN of the total currency (value) was detected in the last financial year by the banking system without all these disruptions. Till the RBI officially discloses the FICN figures, we cannot reach any conclusion. 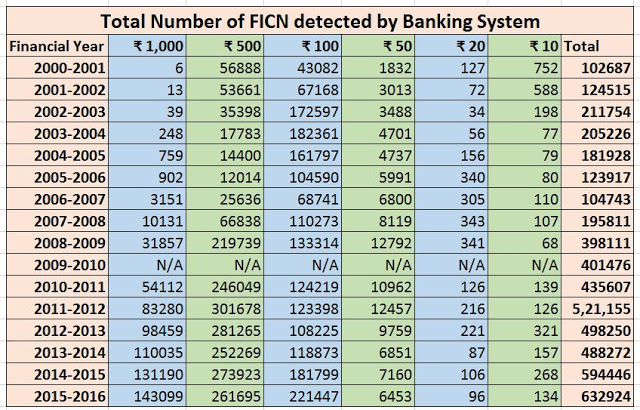 I have analysed the RBI's annual reports from 2000-01 to 2015-16 to gather pointers about the FICN detection in the banking system (Except the FY 2009-10, denomination wise FICN data is available for all other years). The following table is prepared from the above data gives a clear picture of the FICN detected in the system by volume (denomination wise). From the table it can be seen that a majority of FICN is in high denominations of Rs 1000, Rs 500 and Rs 100. This is quite natural considering the printing and hoarding parameters. The volume and value of lower denominations of FICN are very insignificant compared with the high denomination notes, which constitute 96% of the total currency in circulation. The RBI reintroduced Rs 1000 notes in October 2000, after demonetising it in 1978 along with Rs 5000 and Rs 10,000 notes. From the above table it is evident that it took almost eight years to counterfeit these Rs 1000 notes to a substantial quantity, of more than 10,000. This fact shall be compared with the news now pouring in of the counterfeit notes of new Rs 2000 denominations amounting to lakhs of rupees within a couple of months after its introduction. So it is high time that we think whether demonetisation can throttle the fake currency in this digital age or not. For handling the increasing quantum of notes received for examination, the Reserve Bank had commissioned very sophisticated Currency Verification and Processing Systems at the Bhopal and Chandigarh issue offices as a pilot project during FY 2000-01. These systems can sort the notes into issuable and non-issuable categories, detect counterfeit notes and destroy the non-issuable notes in an eco-friendly manner through shredding and briquetting systems. In the year 2002-03, RBI commissioned 22 CVPS at its issue offices, which can process 50,000-60,000 notes per hour. By the end of FY 2003-04, RBI had installed a total of 48 CVPS at 18 offices. They procured six more CVPS in 2004-05 and another 5 CVPS in 2009-10. The annual report of 2011-12 says there are 59 CVPS already under RBI. After that the annual reports does not mention any additional procurement of the same. 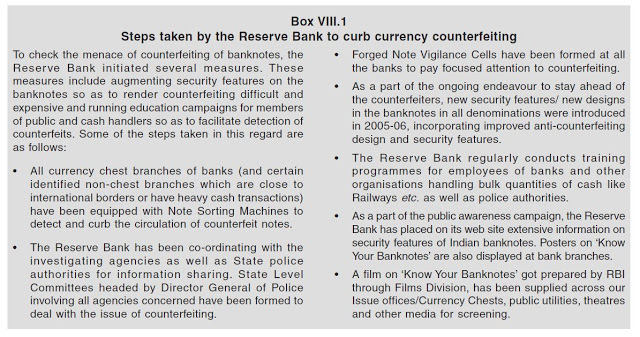 During the year 2000-01, banks were instructed by RBI to equip their branches with ultraviolet detectors and staff from banks, government departments, the police and other enforcing agencies are being regularly trained on security features in bank notes to facilitate the detection of forgeries. In the year 2002-03, RBI advised all banks to establish Forged Notes Vigilance Cells at their headquarters for dissemination, monitoring and implementation of the Reserve Bank's instructions on forged notes to their branches and compiling of data on detection of forged notes and follow-up of cases filed with police etc. During 2004-05, banks were advised by RBI to install Note Sorting Machines (NSM) capable of detecting counterfeit banknotes at currency chests. Banks with less than 100 currency chests were given time till the end of May 2005 for installing such sorting machines in each of the currency chests. Banks with 100 or more currency chests were given time till November 2005. Bank branches with average daily cash receipts of Rs 50 lakhs were advised by RBI to use such NSMs by end-March 2011. The increased use of NSMs, facilitated the detection of FICN at the branch level itself before they reached RBI. The share of the counterfeit notes detected at the Reserve Bank’s offices declined from 96.1 per cent in 2005-06 to 56.4% in 2006-07 and further to 10.4% in 2010-11, indicating the increased effective use of NSMs at currency chest branches. As of 2015-16, only 5% counterfeit currency was detected at the RBI level and the rest 95% are detected at other banks. 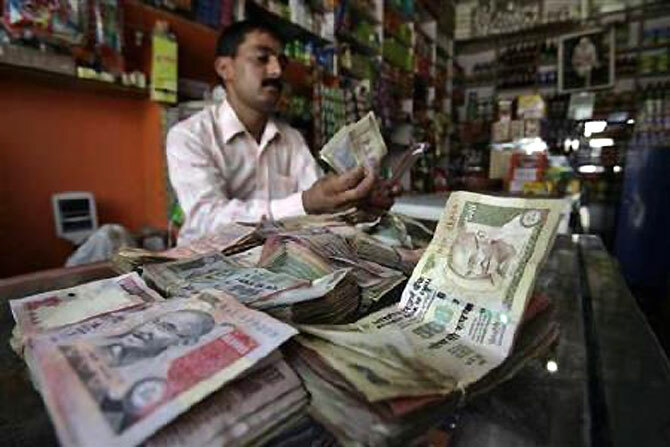 A high level group on systems and procedures for currency management (chairperson: Usha Thorat, deputy governor, RBI) constituted by the bank, submitted its report in August 2009, to enhance the integrity and efficiency of the systems and procedures for stocking and distribution of currency notes. The group suggested different measures for detecting counterfeit notes and maintaining good quality notes in circulation, and strengthening security systems. As per its recommendations, to ensure the issuance of only clean and genuine notes to the public, banks should use note-sorting machines. The Reserve Bank, in turn, should set parameters and standards for such machines. To instill confidence in the public in the banknotes in circulation, banks have been advised to re-align their cash management in such a manner as to ensure that cash receipts in denominations of Rs 100 and above are not put into re-circulation without the notes being machine processed for authenticity. The Reserve Bank also introduced an incentive-penalty system relating to detection and reporting of counterfeit notes by banks. The first banknote issued by independent India was the one-rupee note issued in 1949. While retaining the same designs, the new banknotes were issued with the symbol of Lion Capital of Ashoka Pillar at Sarnath in the watermark window in place of the portrait of King George. The name of the issuer, the denomination and the guarantee clause were printed in Hindi on the new banknotes from the year 1951. The banknotes in the denomination of Rs 1000, Rs 5000 and Rs 10000 were issued in the year 1954. Banknotes in Ashoka Pillar watermark series, in Rs 10 denomination were issued between 1967 and 1992, Rs 20 denomination in 1972 and 1975, Rs 50 in 1975 and 1981, and Rs 100 between 1967 and 1979. The banknotes issued during the above period, contained the symbols representing science and technology, progress, orientation to Indian Art forms. In the year 1980, the legend 'Satyameva Jayate' was incorporated under the national emblem for the first time. In October 1987, the Rs 500 banknote was introduced with the portrait of Mahatma Gandhi and the Ashoka Pillar watermark. The banknotes in MG Series – 1996 were issued in the denominations of Rs 5 (introduced in November 2001), Rs 10 (June 1996), Rs 20 (August 2001), Rs 50 (March 1997), Rs 100 (June 1996), Rs 500 (October 1997) and Rs 1000 (November 2000). All the banknotes in this series bear the portrait of Mahatma Gandhi on the obverse (front) side, in place of the symbol of Lion Capital of Ashoka Pillar, which has also been retained and shifted to the left side, next to the watermark window. This means that these banknotes contain the Mahatma Gandhi watermark as well as Mahatma Gandhi's portrait. The MG series 2005 banknotes are issued in the denominations of Rs 10, Rs 20, Rs 50, Rs 100, Rs 500 and Rs 1000 and contain some additional / new security features as compared to the 1996 MG series. The Rs 50 and Rs 100 banknotes were issued in August 2005, followed by Rs 500 and Rs 1000 denominations in October 2005 and Rs 10 and Rs 20 in April 2006 and August 2006, respectively. i. Security thread: The silver-coloured machine-readable security thread in Rs 10, Rs 20 and Rs 50 denomination banknotes is windowed on the front side and fully embedded on the reverse side. The thread fluoresces in yellow on both sides under ultraviolet light. The thread appears as a continuous line from behind when held up against light. 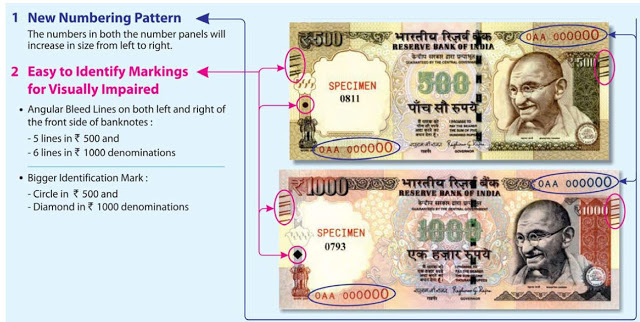 Rs 100, Rs 500 and Rs 1000 denomination banknotes have machine-readable windowed security thread with colour shift from green to blue when viewed from different angles. It fluoresces in yellow on the reverse and the text will fluoresce on the obverse under ultraviolet light. Other than on Rs 1000 banknotes, the security thread contains the words 'Bharat' in the Devanagari script and 'RBI' appearing alternately. The security thread of the Rs 1000 banknote contains the inscription 'Bharat' in the Devanagari script, '1000' and 'RBI'. ii. Intaglio printing: The portrait of Mahatma Gandhi, Reserve Bank seal, guarantee and promise clause, Ashoka Pillar emblem, RBI’s governor's signature and the identification mark for visually impaired persons are printed in improved intaglio. iii. See-through register: On the left side of the note next to the watermark window, half the numeral of each denomination (10, 20, 50, 100, 500 and 1000) is printed on the obverse (front) and half on the reverse. The accurate back to back registration makes the numeral appear as one when viewed against light. v. Optically variable ink (OVI): The numeral 500 and 1000 on the Rs 500 and Rs 1000 banknotes are printed in Optically Variable Ink, viz, a colour-shifting ink. The colour of these numerals appears green when the banknotes are held flat but would change to blue when the banknotes are held at an angle. vii. Latent image: In the banknotes of Rs 20 and above, the vertical band next to the (right side) Mahatma Gandhi portrait contains a latent image, showing the denominational value 20, 50, 100, 500 or 1000 as the case may be. The value can be seen only when the banknote is held horizontally and light allowed to fall on it at 45°; otherwise this feature appears only as a vertical band. viii. Micro lettering: This feature appears between the vertical band and Mahatma Gandhi portrait. It contains the word ‘RBI’ in Rs 10. 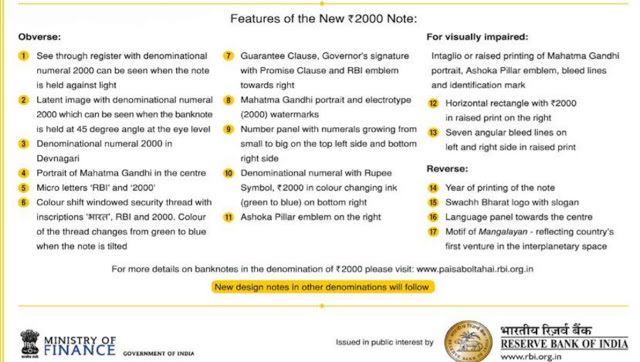 Notes of Rs 20 and above also contain the denominational value of the banknotes. This feature can be seen better under a magnifying glass. Security features of bank notes need to be reviewed and upgraded from time to time in order to take advantage of research and technology to combat counterfeiting. The notes issued in any series/design by the Reserve Bank continue to be legal tender for all time, although over a period notes in a particular series/design may not be seen any more because of discontinuance of printing issues in that series/design. In some countries, where the volume of notes in circulation is small, a new design replaces an old design every 5-6 years and the old design is discontinued as legal tender. In such a situation, prevention of counterfeiting is strengthened. In India, while it is difficult to remove an old design by way of withdrawing its legal tender, the Reserve Bank is attempting to phase out the old design by not re-issuing it once it comes to the currency chests or the Reserve Bank's offices. Although the predominant reason for new security features is to make counterfeiting difficult, they also assume importance in the context of the mechanised cash processing activities by high-speed currency verification and processing systems (CVPS). The success of these systems in achieving the authenticity and rated capacity depends greatly on the notes having machine-readable security features. The MG-2005 series notes have machine-readable compatibility while Pre-MG 2005 series do not. During 2011-12, banks were instructed to stop re-issue of banknotes of Rs 1,000 denomination of the Mahatma Gandhi Series 2000 and Rs 100 denomination of the Mahatma Gandhi Series 1996 in a prompt, smooth and non-disruptive manner without any inconvenience to the public. Such banknotes, however, continued to be legal tender and acceptable for all transactions and no member of the public was denied exchange facility. Further, in order to ensure that all cases of detection of counterfeit notes at the bank branches/treasuries were promptly reported to the police authorities, it was decided to revise the procedure to be followed on detection of counterfeit banknotes at bank branches, treasuries and sub-treasuries. During FY 2013-14, as a move towards mitigation of risk arising out of multiple series of banknotes in circulation, at the request of the Government of India, from March 31, 2014, the Reserve Bank set in process the withdrawal from circulation all banknotes issued prior to 2005 as they have fewer security features as compared to banknotes printed after 2005. The withdrawal exercise was in conformity with the standard international practice of not having multiple series of banknotes in circulation at the same time. The Reserve Bank has been withdrawing these banknotes in a routine manner through banks. These banknotes were freely exchanged at any bank branch till January 1, 2015. This exchange facility was later extended up to June 30, 2016. From July 1, onwards, the facility for exchange of pre-2005 banknotes was offered only at issue offices of the Reserve Bank. Central banks worldwide adopt a standardised practice of periodic upgradation of security features of banknotes to stay ahead of counterfeiters. 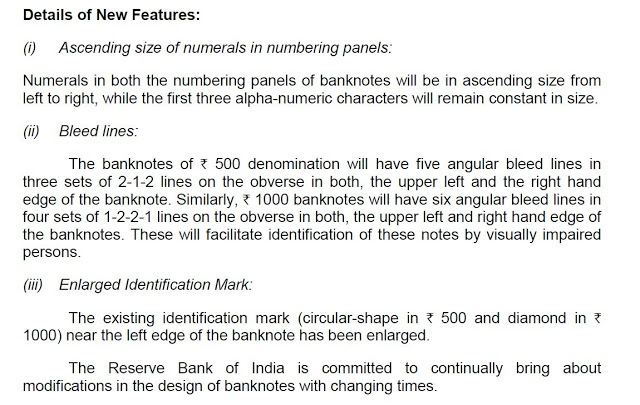 While in India, the last such upgradation was done in 2005 with a new 2005 series of banknotes, certain new features such as bleed lines and exploding numbers were introduced during 2015-16. Exploding numbers is hailed as a great security feature which gives forgers a run for their money. "Printing the numerals in ascending size is a visible security feature in the banknotes so that the general public can easily distinguish a counterfeit note from a genuine one," a release from the RBI had said. The new currency notes of Rs 2000 and 500 introduced post demonetisation were fashionably shrunk in size. The Rs 2,000 note is 66mm x 166mm, smaller than the current Rs 1,000 and even Rs 500 notes. And the new 500 note is just 66mm x 150mm. While the Rs 2,000 paper dons a bright magenta, the Rs 500 is cast in stone gray. Meanwhile, rumour mills spread the propaganda that the Rs 2,000 notes have an embedded nano chip that beams signals to the powers-that-be and will give nightmares to hoarders, which was floated like hot cakes on WhatsApp forwards. Another uplifting forward had Gandhiji’s portrait giving you a tight slap if you tried to offer a bribe with the new note! Anyway, the new notes do not have such features from straight out of a sci-fi movie, so have a prolonged wait for such happy happenings! Let's examine the features of the new notes one by one to see what are the additional security features in place in the new notes, which are not there in the notes prior to demonetisation. Now that we have seen that no additional security feature was added to the new notes than what was existing. So make your own judgement based on facts, when tall claims are made that the new notes are going to make counterfeiting one hell of a tough task. If those high security notes introduced in 2015 were kept in the system, the pain due to demonetisation can be ameliorated to a certain extent. But unfortunately, such thought process have no place in the hasty demonetisation decision. When I finished my research into fake currency, some questions perplexed me, so let me share them with you. Hope either our House Panel or the Supreme Court may ask these questions of the RBI. While taking the recommending the demonetisation whether the Central Board of RBI considered their own data and Indian Statistical Institute study and apprised the Cabinet about the above study and vital inputs? Whether RBI, being the premier financial institution, has done any cost-benefit analysis of the impacts of the demonetisation in short term and long term on the economy before taking this drastic decision? When the Rs 500 notes was showing a decreasing trend in FICN for last several years, what was the logical reasoning behind RBI's decision to demonetise this particular denomination, which constitutes 50% total currency in circulation? Why did RBI not take a decision to exempt the Rs 1000 & Rs 500 notes with added security features introduced in 2015 from the demonetisation? Especially since the new currency notes have no additional security features than the ones already existing in the 2015 notes? Why did RBI print and circulate the above denomination notes with high security features dated from 2015, only to demonetise them at a later date by wasting exchequer's money?